When it comes to sports, people often think of basketball, soccer and baseball. But what about other sports such as fencing? Although fencing isn’t a traditional sport with a ball and two teams, it’s still quite rigorous and challenging. But for sophomore Chuyi Zhang, only two years of training has brought her to the Junior Olympics tournament for fencing in Denver, Colorado. Despite being relatively new to the sport, Zhang is already feeling quite comfortable in the competing aspects of fencing. “Fencing is sort of a theatric sport. It’s a sport and a mind game at the same time,” Zhang said. With her 12 years of dancing background, Zhang adapted to the fencing techniques very quickly. In the summer of 2017, Zhang and her mom came across a fencing ad in the San Ramon activities catalog. Soon after, Zhang enrolled in fencing classes and has enjoyed competing in the sport ever since. Zhang puts lots of time and effort into the sport, on top of all her other activities. Despite keeping herself busy with four weighted classes and being part of a dance team, she still finds time to dedicate to her new passion. Sophomore Angela Paloma, another one of Zhang’s friends, agrees. 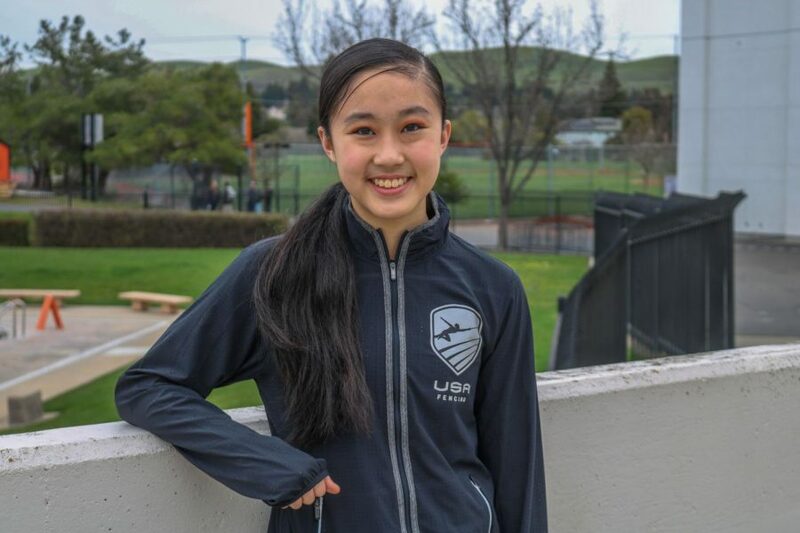 Zhang’s hard work earned her a spot in the Junior Olympics for fencing on Feb. 15-18. As a newcomer to the sport, Zhang felt nervous, but ready for the experience. “I was pretty excited, especially because it was my first national tournament,” Zhang said. Although Zhang didn’t receive the results she wanted, she was still satisfied and ready to learn more. “After the Junior Olympics, I had a lot to take away from it. I’ll be able to apply that in the future,” Zhang said. Zhang participates in épée, one of three types of fencing. In épée, fencers are not restricted to specific parts of the body and are allowed to hit their opponent anywhere. Despite being prone to hits everywhere, fencers must be able to move quickly and be the first to “poke” the opponent. They also have to stay within boundaries on a small and thin strip of mat. Due to this, Zhang experiences countless bruises and abrasions on her arms and legs. “But, you do wear a lot of equipment, so you’ll be fine,” Zhang said. Despite the injuries that may occur, Zhang loves fencing in general. “Watching other people [fence] is really fun,” Zhang said. In fact, watching others is a learning experience for herself. “Chuyi tries to compete as much as she can in nearby cities as well as learn from the other fencers,” Zhang’s mother said. Zhang especially looks up to team USA fencers Katharine Holmes and Emily Vermuele as her role models in fencing. Zhang’s passion for fencing, that has grown in the past two years, has developed daily, taking classes, competing on a national scale, and wholeheartedly enjoying the sport. Zhang wants to keep fencing in the future, taking her love for fencing beyond high school.